Welcome to the October/November round of Cook the Books. Thanks to Claudia from Honey from Rock for hosting with The Patriarch by Martin Walker. I am not much of a mystery fan. Never have been—I think it is my impatient nature. Walker’s cast of characters (and there is a lot of them) did keep me intrigued along with the rustic traditions and beauty of St. Denis. Claudia promised that we would find lots of food and drink in the novel as the main character, Police Chief Bruno, is somewhat of a gourmand. Indeed he is and indeed I did find much culinary inspiration in the novel, everything from fine French wine to smoked fish to croissants. (I did keep a roster of all the food and beverage found in the novel. If you’re interested, it’s at the end of this post.) 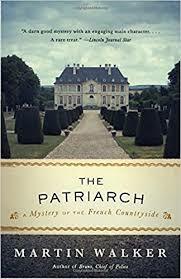 Really, the amount of feasting in the book is as rich and plentiful as the French countryside. I took my inspiration from an impromptu dinner invitation that Bruno accepts from a Paris colleague. 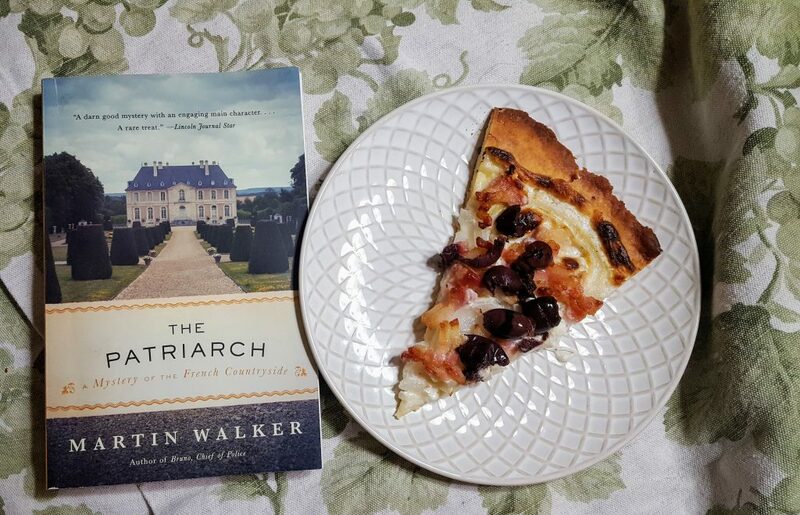 Monique, the Prunier’s wife, serves two versions of Flammenkuchen (Tarte Flambée) for dinner. 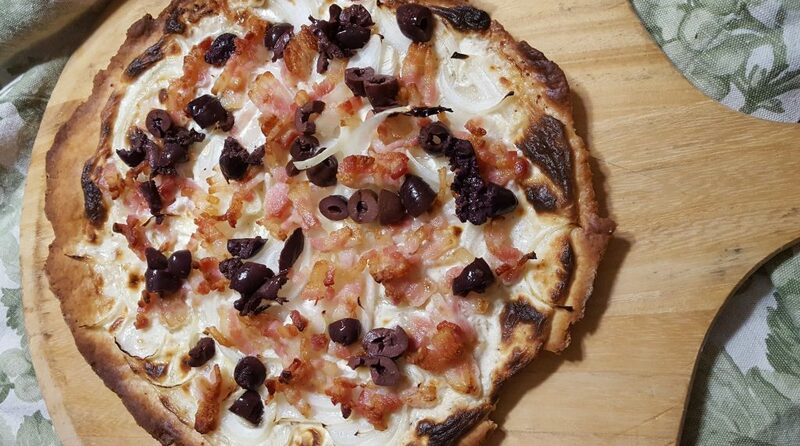 The dish is “a Teutonic form of pizza.” The first version brought to the table was a traditional one: “The thin crust of pastry was covered in creme fraiche, thinly sliced onions and bacon” (131). The second Flammenkuchen Monique served was “bedecked with leeks and sun-dried tomatoes” (132). The edges got a bit “golden” as I was ensuring the bacon was crisp. I was inspired by this familial scene, the atmosphere of which was such to make Bruno wish and wonder if he would ever have such a family life. Note: I found a hint that if you can’t find fromage blanc, you can substitute the fromage blanc and crème fraîche mixture with either quark or equal parts buttermilk and cream cheese (blended until smooth). I also found many recipes for making your own fromage blanc. For this pizza, I used the 1/4 c. creme fraîche and regular cream cheese for the fromage. In a small mixing bowl, combine crème fraîche, fromage blanc, nutmeg, 1/2 teaspoon salt and the pepper. Set aside while you make the dough. In the bowl of a food processor, combine flour, baking powder, remaining 1/2 teaspoon salt, olive oil, egg yolk and 1/4 cup water. Pulse to combine. You may need to add a bit more water (depending on the size of your egg). Process until a ball of dough forms. Place a piece of parchment paper on a work surface and dust with four. Roll out dough to a 12-inch round shape. (Dough will be thin.) Transfer dough AND parchment paper to a pizza peel or a rimless baking sheet. Spread cheese mixture evenly over the dough, leaving a 1/2-inch border along the edges. Layer on onions and then sprinkle on the bacon. Slide tart, still on parchment paper, off peel and directly onto pizza stone in oven. Bake until top is beginning to brown, and sides are golden and crispy, about 20 minutes. Remove from oven. Sprinkle on olives. Serve warm. The crust on this “Teutonic form of pizza” is pastry-like and holds up well to the soft cheese. The outer rim got a bit well-done as I waited for the bacon to crisp up. When I make this again, I think I will partially cook the bacon before it goes into the oven. I also think this would be delicious with caramelized onions. And, I would certainly like to make the leek and dried tomato version as well. He was intrigued by his idol, the Patriarch’s life—all aspects of it. He examined Crimson’s art collection and wondered if he could possibly acquire a collection like this over time. He often wonders how his life would have been different “if he’d had better schools, better teachers and a chance to go to university”(216). Yet, despite all these musings, he never seemed enviously jealous. Instead, I got the impression these were fond observations with just a hint of wistfulness. Although it becomes a bit obvious as to whom the villain is in the novel, I still had to prove myself right and my reading speed got quicker and quicker as the end approached. I enjoyed all the characters Walker created (even though I sometimes had to draw a family tree map) and the twists and turns and side roads were entertaining. Thanks again for hosting, Claudia! I did not even attempt to list all the wine, but this is what I listed before I landed on the Tarte Flambée, but if you’re interested in what was mentioned, here you go! Look for an announcement post soon at Cook the Books. Deadline for posting is January 31, 2018! I am linking this post to November Foodies Reads. Flammenkuchen are very popular over here and our favourite is the one the onions. Love your version with olives. Thank you, Angie. I wish it hadn’t gotten so dark around the edges but we like a crisp crust. Not sure if I’ve ever had a flambee or flambee tart. Great list of ingredients and certainly caught my interest. Great looking dish! I thought I had read all the Bruno, Chief of Police, books but I seem to have missed this one. I plan to read it very soon! You need to pick this one up then, Mae. Oh yes! Cut me a slice now, please. I should know better than to read food blogs while I’m hungry. 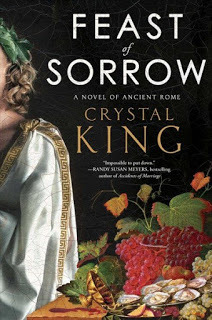 I think I may join you for the Feast of Sorrow., It’s been hectic and I haven’t been able to participate as much as usual, but this next book sounds pretty good. It’s like grocery shopping when you’re hungry….Hope you join us for the December/January round. This is such a delicious, classic combo! That Deadly Cocktail you listed caught my eye too… but I’m quite sure I don’t need that. LOL! 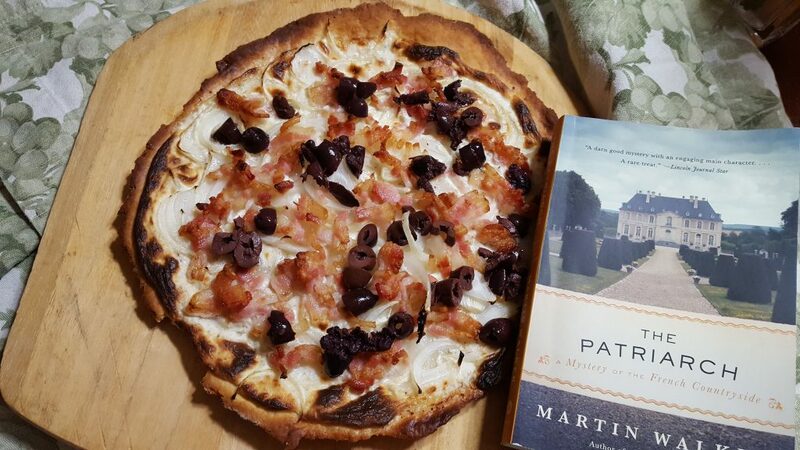 The Flammenkuchen was on my short list to make too–it sounded so good in the book. Yep. I should have done a nice pairing. Lotta eating in that book! And much of it really good. Certainly this tart looks wonderful. Fun dish — thanks. Yep, there’s a lot of great eating in there. It was hard to pick. I can’t believe I didn’t halt right at that Tart Flambee, as we’re such pizza enthusiasts! It is on my to do list. And, glad you enjoyed the novel. He’s a favorite author. Looking forward to our next CTB read. Thanks for hosting, Claudia. I took the book to the in-laws over Thanksgiving and left it with them. They’re pretty big mystery fans. Hope they like it. I was tempted by the Flammenkuchen and nearly made it as well. I can’t wait to write up my review and make a recipe from Feast of Sorrows. I can’t tell you how much I LOVED that novel. I am so glad to hear that you love Feast. It’s always a bit nerve racking recommending books and movies for CTB and FnF, respectively. MMM…sounds delicious, Cathy. Must try. Thanks, Simona. This is a recipe I will revisit.